Video footage of reunited New York death metal legends SKINLESS performing a brand new song, "Serpenticide", on January 18 at Upstate Concert Hall in Clifton Park, New York can be seen below. 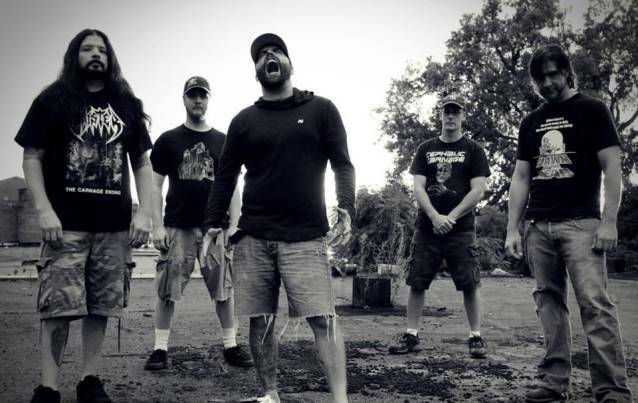 SKINLESS is currently writing material for the long-awaited follow-up to 2006's "Trample The Weak, Hurdle The Dead" for an early 2015 release. Says guitarist Noah Carpenter: "SKINLESS is far overdue for a new album so that will be our priority for the [this] year. Basically, we're going to put the 'Progression', 'Foreshadowing' and 'Trample' albums into a blender, add some guitar solos and serve up the heaviest SKINLESS release yet." Formed in 1992 in Albany, New York, SKINLESS has released four full-length albums and numerous EPs throughout its 20-plus-year career. After disbanding in 2011, the group is now back together with the classic "Progression Towards Evil" lineup (Sherwood Webber on vocals, Noah Carpenter on guitar, Joe Keyser on bass, Bob Beaulac on drums) plus the recent addition of Dave Matthews on second guitar.